Please read through the project descriptions below, then click the Volunteer button above to be directed the sign-up form. Community-wide enrollment runs from December 11th – 20th and from January 3rd – 18th. 20 Volunteers Needed for Set-Up the event by unloaded canned goods for nine holes of the Golf Tournament. 15 Volunteers Needed to assist the groups of 4 during the Putt Putt Tournament. 20 Volunteers will be needed after the tournament to help deconstruct the holes, sort the donations, and load them into the pantries' trucks. Recent debates about the need for civility in politics have drawn many scholars back to Dr. King's Letter from a Birmingham Jail, in which Dr. King responds to complaints by self-proclaimed moderate white clergymen who called his methods of nonviolent resistance "unwise and untimely." In this session, we will examine Dr. King's message in this letter and consider its relevance for contemporary resistance movements. 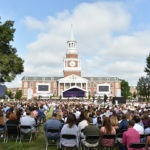 This year, as part of HPU's Martin Luther King Day of Service, we are providing students and faculty with educational means of service. We believe that educating ourselves on social injustice would've been just as important to Dr. King as direct service. After the assassination of Rev. Dr. Martin Luther King, Jr., the movement did not stop. Rather, without missing a beat, many strong folks picked up his rhythm. Drs. Estrada and Isaksen will start this interactive workshop by briefly giving voice to The Rev. Dr. William J. Barber’s “fusion politics”; Professor Bryan Stephenson’s expansion of the term terrorism; and the women who started the Black Lives Matter Movement. Dr. King fought for equity in education because he recognized that social factors like race, culture, and socioeconomic status, shape the process in which individuals learn. In this workshop, Drs. Malburne-Wade, Blosser and Squint will lead an interactive dialogue based on three main concepts: framing discussions of race, engaging students in those discussions, and handling frequent challenges therein. This workshop will discuss the power of awakening your voice and the ways in which personal values can be turned into meaningful action. We will briefly explore examples of ordinary people who used their voice to do extraordinary things in the in the face of social injustice. Through interactive discussion, participants will be empowered to consider the ways in which their voices can be used in practical ways to impact, challenge and transform. A conversation surrounding social, political and cultural context of “Place and Space” in Communities of Color. This workshop led by Southside Neighborhood Association President, Tony Collins, will discuss the history of High Point’s Southside, hoping against hope, testimonials from community dream seekers and the details of brining these dreams to light. Learn about how the topics of Dr. King’s work are effecting your community. Volunteers will help The Outreach Program set up for their meal packaging event. Volunteers will work with The Outreach Program in order to package meals that will later be distributed to local community organizations. Volunteers will help The Outreach Program breakdown and clean-up following their meal packaging event. For the group who volunteers to facilitate: volunteers will act as different members of a community who run businesses and social services. For those who participate: Participants will be grouped into families and will go around to different stations that represent the different things a family faces every month. After paying bills, do you spend your remaining money on food, healthcare, or entertainment? Volunteers will clean out the plots and garden areas. Volunteers will assist in 5 or 6 facility improvement projects. From painting to landscaping, debris cleanup or moving furniture and bonfire upgrades. Volunteers will take part in improving the facilities for the future community use. Fairview Elementary is having 2-4 truckloads of mulch delivered for its Monday MLK day project and needs volunteers to help unload the mulch from the delivery trucks. Volunteers will shovel/scoop mulch from truck bed to create a pile on the school’s playground. Please sign up for Fairview’s Monday event as well if you’d like to continue helping Fairview beautify the grounds. Disposable garden gloves will be provided but in order to reduce waste please bring gardening gloves if you have them! Fairview elementary school needs help mulching the school playgrounds. Mulch acts as padding on the playground however, Fairview’s mulch has not been done in several years and currently provides no extra safety for students. Volunteers will help spread mulch on the school’s playgrounds and garden. Disposable garden gloves will be provided but in order to reduce waste please bring gardening gloves if you have them! Please dress according to the weather- food will be provided for volunteers. Volunteers will assist as day camp counselors and help students with activities such as; helping host a food drive for LEAP's food bank that will be opening MLK Day, packing go bags full of toiletries for the homeless, and cleaning up the LEAP2Grow garden. Volunteers will be building raised beds for a local community garden. Piedmont Christian Home is an assisted living facility in High Point, NC. 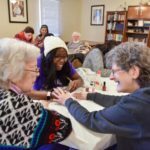 Come share a bond with residents over fingernail painting. Light refreshments will be provided. Piedmont Christian Home is an assisted living facility in High Point, NC. Come spend your day of service participating in arts & crafts or playing bingo with our residents. Volunteers will be painting the school's outdoor blacktop for students to use during recess. Volunteers will be clearing trash and organic debris from the community garden and loading the box truck with debris. Volunteers will need to follow the box truck to the compositing site to help unload. This group will be helping to give a deep cleaning to the World Relief Offices. Will involve vacuuming, scrubbing wall and kitchen area, and potentially moving some small furniture. This group will be helping to wash and detail World Relief’s fleet vehicles, including 2 vans and a box truck. For this greenhouse project we are doing some repairs to fix the drainage and water flooding problems we have been having post-hurricane. Volunteers will assist the HUP Civitan Club with serving dinner at Open Door Ministries. Two volunteers will cook from 4-6pm and four volunteers will serve from 5:45-7:30pm. Volunteers will assist the HUP Civitan Club with serving dinner at Open Door Ministries. Two volunteers will cook from 10am-12pm and four volunteers will serve from 11:45am-1:30pm. We are looking for volunteers to assist with painting walls in the student bathrooms and/or in our hallways. This effort will help promote student social & emotional well-being by inspiring them through quotes and images of positivity. Volunteers will assist middle school students in fixing up their school's greenhouse. Tasks include clearing out storage material, cleaning up interior, painting, and building tables. We hope you will join the staff Homegrown Heroes in this endeavor during the MLKJ Day of Service. Volunteers will organize storage rooms upstairs so that West End can use it as a multipurpose room. Volunteers will help to organize Leslie's House, a safe house for homeless women without dependents. Volunteers can help sort through stock in the kitchen we use for our community meal. Volunteers will help to repaint a few of the walls at the nearby Boys And Girls Club. Volunteers will be turning the soil over in the beds and pulling weeds. Volunteers will help to remove weeds near a fence, remove weeds from garden, put in fresh soil, clean up garden plots and sow some seeds. Volunteers will be picking up litter near Hickory Chapel Road in High Point, NC. Dr. Martin Luther King Jr. once said, “Life’s most persistent and urgent question is: ‘What are you doing for others? '” Each year, Americans across the country answer that question by coming together on the MLK Holiday to serve their neighbors and communities. The MLK Day of Service is a part of United We Serve, the President’s national call to service initiative. It calls for Americans from all walks of life to work together to provide solutions to our most pressing national problems. Read more about the MLK Day of Service at MLKDay.gov.